Members of the Cal. National Guard stand silently as the backdrop for a news conference in El Centro, Cal. by the local head of Customs and Border Protection, Gloria Chavez. Steve Walsh reports on the activities of the California National Guard at the U.S./Mexican border. California's National Guard quietly arrived at the state's border with Mexico in early May, about a month after President Trump announced what he called "a big step" of "guarding our border with the military." But far from the image of military Humvees or helicopters patrolling the border, the majority of California guardsmen aren't even outdoors. Rather, they're working mainly in administrative jobs and keeping a very low profile. The troops, who are mainly volunteers from around the state, have appeared publicly only briefly. 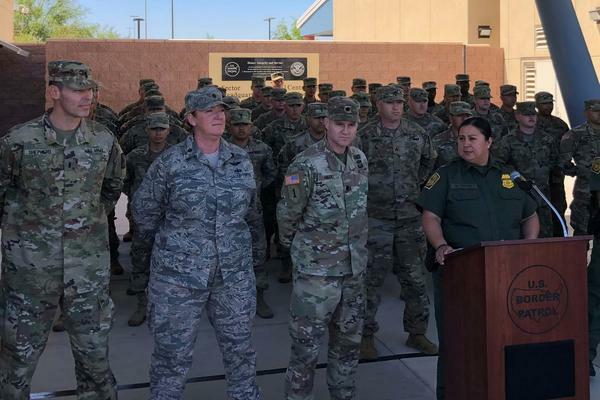 A week after they arrived, the first guardsmen marched out of the El Centro Border Patrol Station and stood silently as the backdrop for a press conference called by the local head of Customs and Border Protection, Gloria Chavez. "CBP continues to welcome National Guard personnel to the southwest border," Chavez said. After the event, the troops filed out without speaking. Call it cooperation in the age of Twitter. While the President challenges California Jerry Brown's position on just about everything -- especially immigration, behind the scenes the state and federal government quietly worked through their differences. 250 of the 400 National Guard troops Brown authorized have arrived at the U.S. Border Patrol districts of El Centro and San Diego. They'll analyze intelligence and act as dispatchers. Under the rules negotiated with the Pentagon, they'll monitor cameras on the U.S. side of the border, but not cameras that look across the border into Mexico. "These 51 National Guardsmen behind me will assist the U.S. Border Patrol with logistical and administrative support," Chavez said at the news conference. "The National Guard will not be armed. They're in a mission support role behind the scenes," she said. The fact that guardsmen won't be armed isn't new. Tim Dunn with Salisbury University in Maryland has researched militarization of the border. He says the Pentagon has been reluctant to arm troops since 1997. That's when Marines from Camp Pendleton, Cal. shot and killed a rancher outside Redford Texas, whom they mistook as a smuggler. "So they scaled back the use of armed ground troops and allowed all the other forms of military assistance -- intelligence support, construction, training, equipment operation. Anything short of armed ground troops could be done," Dunn said. It stayed that way until the Pentagon resumed some armed patrols in the years after September 11, 2001, Dunn said. The Secretary of Defense or one of his deputies now has to sign off on this type of mission. The Pentagon estimates it will cost $182 million to keep guard troops activated at the border through September. The government spent roughly $1.35 billion to send the guard to the border during the Bush and Obama Administrations, Dunn said. But he questioned the expenditure. "What are we getting for that? The apprehensions are at historic lows. Even though apprehensions are up a little this year, they've been low since 2011," he said. Border Patrol officials in California say numbers don't tell the whole story. San Diego Sector Chief Rodney Scott said his district is understaffed, in part because the high cost of living makes recrutiing difficult in San Diego. He said he'll use most of this round of guardsmen as radio dispatchers. "I have significant vacancies in that area that they can fill," Scott said. "On top of that, we have significant vacancies, anyway. I think it's no secret that we have some recruiting challenges." So even when the Guard performs mundane tasks like changing the oil in vehicles, that frees up agents, he said. "We have a very small mission support contingency," Scott said. "We don't have a big engineering group for example. We either have to take an agent out of role to do that or we have to contract those services out." This kind of cooperation is fairly routine, Scott said. Even before President Trump's order, guardsmen already monitored cameras at stations all the way up the California coastline. "We've got a long relationship with the National Guard," Scott said. "We've been working with them my entire career, and that's been 25 years." Scott sees the guard as a temporary solution, but one he'd like to see continue for a while. He said he hopes "Operation Guardian Support" will last beyond its Sept. 30 sunset. Texas Gov. 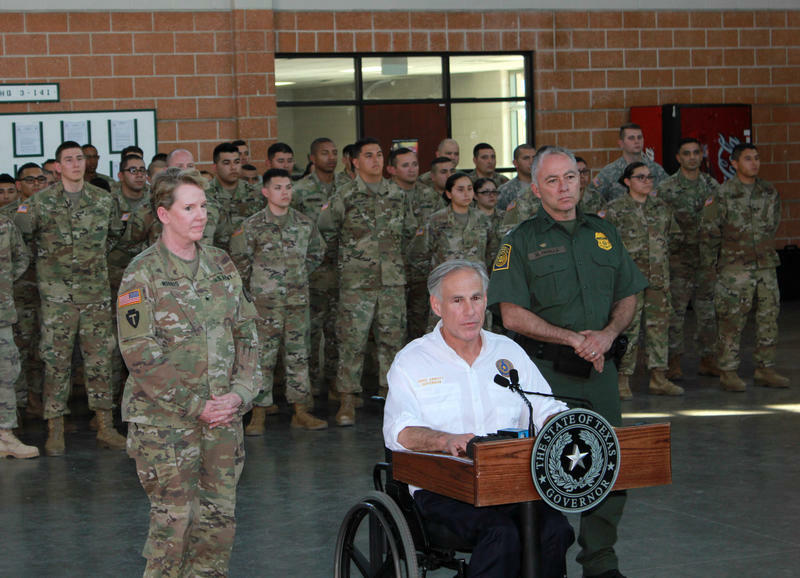 Greg Abbott said Thursday that the Texas National Guard has so far deployed around 760 guardsmen along the U.S.-Mexico border in response to a call to action from President Trump.